Sometimes writers are explicit with their purpose. They directly state their reason for writing. Even in a title, you might find the purpose. An article entitled “The Case Against the Vietnam War” will clearly argue against the war. For much writing, however, the purpose is much more implicit. You will have to infer the author’s purpose. Play the following video from the U.S. Army. Then read the Uncle Sam poster. As you view each, consider just how explicit each message is. Write your answers to the questions below using your notes. When you are finished, check your understanding below. 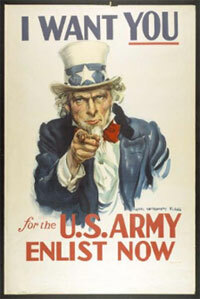 The poster explicitly states that Uncle Sam wants the reader to enlist in the Army. The poster's purpose is to recruit people into the Army. The video is intended for a young, diverse audience. Because there are many soldiers who are African-American, it may be intended to appeal to a young, African-American audience. The video was created by the Army. Which purpose does the video serve? A. It informs or explains. B. It entertains or narrates. C. It persuades or argues. D. It reviews or examines. A. Incorrect. The video provides very little information about the Army, although it does invite the viewer to learn more from the Army Web site. B. Incorrect. While the video may be interesting, it doesn't tell a story or amuse the audience. Its purpose is not to entertain. C. Correct! The video persuades viewers that they will grow strong and gain important job experience by enlisting in the Army. D. Incorrect. The ad mentions some of the benefits of serving in the Army, but it doesn't examine any of the drawbacks. It is clearly not giving a balanced view of military service. The two ads differ in that the Uncle Sam poster explicitly requests that readers join the Army. The video, on the other hand, is implicit. It doesn’t tell viewers to join the Army but instead provides benefits of joining the Army. The video serves as a teaser to grab the viewer’s interest. The producers hope viewers will visit the Web site, learn more about the benefits of Army service, connect with a recruiter, and make the decision to join on their own. So, why is it important to know the author’s purpose? After all, even in the implicit Army ad, it’s pretty obvious that the producers want the audience to join the Army. Sometimes, though, a writer prefers to offer evidence before an opinion in order to persuade you. By keeping the purpose implicit, a writer can be more engaging. 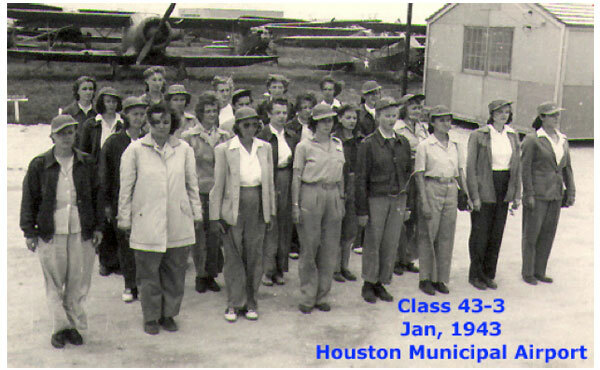 WASP (Women Air Service Pilots) from class 43-3 taken at Houston Municipal Airport by Lois Hailey, a member of the unit. Let’s look at several short paragraphs about women in battle. Until the 1990s, women were not permitted to participate in battle in the United States Armed Forces. For some time, the idea of allowing women into battle was quite a controversy. Although the paragraphs below may appear extremely sexist today, they present some of the arguments used during the 1980s and early 1990s. Imagine the effect of having women in battle. Men will freeze in place as a female soldier’s lips glisten in the sun. Soldiers who had once been focused and precise in their mission would now lose all concentration at the sight of fatigues hugging a trim woman’s body. At the loss of a friend, a woman soldier will weep, triggering male soldiers to console the woman rather than fight the enemy. Women should not be allowed in battle. Their presence will break men’s concentration. The gory nature of war would be emotionally trying for women. Women would make battle more difficult for all. Write your answers to the questions below using your notes. When you are finished, check your understanding. Which paragraph contains an explicit purpose? Which is implicit? Which one is more interesting to read? Why? The first paragraph’s purpose is implicit. The second has an explicit purpose. The descriptions in the first paragraph make it more interesting to read.